Angelina Domino loves animals, especially cats, that is, until Angelina's parents give her a kitten, Boris, for her fifth birthday. Boris is wild and fierce, and scares the daylights out of Angelina. Before long, Angelina's fear of Boris extends to all animals, even gerbils! With the help of a large stray cat named Hector, Angelina must search deep inside of her emotions to find the patience and courage to control her fears. The illustrator, Eugenie Fernandes, uses "soft colours to complement the gentle tone of the text and has given the characters, including the animals, vivid expressions to reflect the range of emotions in the story" (Donald, 2000). The book is written in third person, past tense. "Angelina Domino loved animals, especially cats. So when she was five years old, her parents gave her a kitten. The kitten was gray with blue eyes, and his name was Boris. But Boris was as wild as an African lion. He bit Angelina when she patted him. and scared the daylights out of her" (n.p.). Fear: A common turning point in childhood, so common that it is often the topic of stories for children, is overcoming one's fears. From nightmares to the dark to swimming to going to school, fear comes in many forms, and in many shapes and sizes. 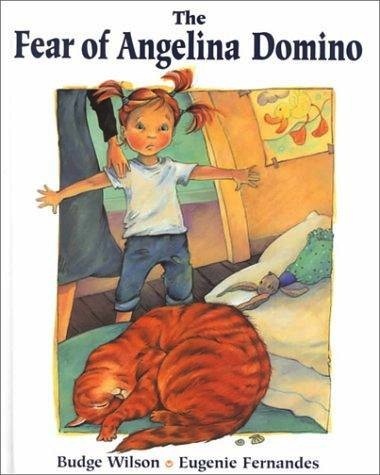 American president Franklin D. Roosevelt famously said that there is "nothing to fear but fear itself," an adage we can apply to the fear of Angelina Domino. Frightened by an unruly cat, Angelina develops a fear of all animals, until, with the unexpected/forced push of her mischief-making friend (who deposits a stray cat into Angelina's room) and the gentle guidance of her mother who, "came over and placed her hand very softely, very carefully, on Angelina's shoulder [because] [s]he wanted her to know she wasn't alone. She wanted her to feel safe" (n.p. ), Angelina overcomes her fear of cats, and, subsequently animals, learning that all she really feared was fear. Whether forcefully or gently, it is important for children to vanquish their fears, espcially before those fears get out of hand. Review: Donald, Bridget. Quill and Quire (June 2000).